Having a rose, or other flowering plant, suddenly covered in aphids can be a a depressing sight. Fortunately, there are many ways to get rid of them and you may not have to use chemicals. This is a guide about getting rid of aphids. Imagine my chagrin this year when for the first time ever I decided to try growing dill and woke up one morning wondering why the upper most tender portions of the plants, which were ready for harvest, were drooping heavily sideways. Upon closer inspection those portions were covered with aphids. Well, I certainly didn't want to use anything as a remedy that would be toxic so went to several internet sites to find a workable natural solution. Mix ingredients well in a lidded glass jar. Add 1 1/2 teaspoons of the solution per each cup of water in the spray bottle and store remaining solution in the jar in the refrigerator. Soak spray the infested plants and surrounding soil. Repeat the rinsing and spraying for two more days and then use the solution thereafter once a week. Do not spray when direct sun is on the plants because the combination of the sun rays and solution will burn the leaves. There are insecticidal soaps on the market, however, I normally just take a small spray bottle with tepid water and a few drops of a mild detergent soap. It is much less expensive and I particularly like the "green" detergent soaps. Controlling aphids takes spraying the leaves (both top and bottom) and also I spray the top of the soil. I do this every day (sometimes twice a day if the infestation is severe) for at least 3 to 5 days. It is important to keep checking the plant every day or two, since there may be a new hatch of aphids. For plants that are outdoors having lady beetles is one of the best solutions. The lady beetle larvae just love to munch on the aphids. As a side note, if you notice ants on a plant that has aphids you will find that the ants are actually "herding" the aphids. They love the sweet nectar that the aphids produce and they keep and protect the aphids as we would do with cattle, sheep, or goats. I mentioned this to a friend at our office who had ants and aphids on a plant and at first he thought I had totally lost my mind when I said the ants were herding their aphids. After I explained the relationship between the two, he seemed to understand and didn't question my sanity. If buying ladybugs is not an option, I have been successful making a spray made from a boiled onion or garlic. Strain the juice and spray on the plants affected by aphids. This works for me. Tobacco juice is also effective. How do I get rid of aphids on my strawberries without using anything that would be harmful to our grandson and our Yorkie? I assume that getting rid of aphids on strawberry plants is the same as getting rid of them on tomato plants. On my tomato plants I spray the underside of the leaves with a water hose, washing the aphids off the plants. They won't climb back up. I have read that tip in several different gardening books and it has worked every year for me for a lot of years. I'm with mvb. The most organic and safe method is to import some ladybugs. Besides your grandson will love them! Another idea is planting garlic or green onions in the area. I have little green onions which put up their own seed "heads" (multiplier bulbs), so there's always more to plant and replace those picked for salads, etc. This is also good anti-thrip on the rosebush protection. I have aphids on my four o'clocks. 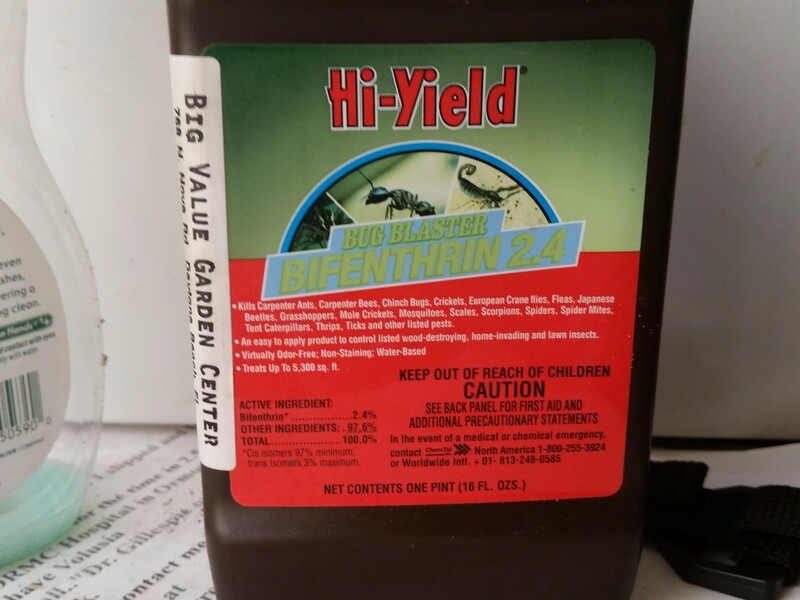 I have tried soap mixed with water applied with a sprayer and have also used high-yield bug blaster Bifenthrin 2.4 mixed with soap. I cannot get rid of these aphids which are sucking the juice out of my plants which are producing seeds. These are genetically modified half-and-half colored flowers; it took me 30 years to breed these. In the only pic of flower you can see the red and yellow on same flower, too early for them to open. Somebody please help! Plants do not die from aphids invasion but I understand it is ugly to look at, specially when they invade beautiful flowers like yours. I never use any chemicals. I used two simple methods, killed them by hands on small plants and never grow one type of plant only, on one spot, always grow next to it, marigold and calendula which are protecting /repelling plants and nasturtium which will concentrate the aphids. Question: Killing Mealybugs, Scales, Aphids, Spider Mites, etc. How do I kill infestations of aphids on my euonymus vine? They have manifested thickly on the stems as well. For around $10 dollars you can buy about a 1000 ladybugs who will be more than happy to clean up those aphids and probably a few of the others as well. They will likely also set up a colony near by and be around for years. But it sounds as though your plant is having trouble for some basic reason. Soil balance or nutrition not right, moisture? The plant isn't doing well there, otherwise it wouldn't be such a victim, poor thing. Might need some companion plants as well that repel those bugs. I think soapy water also helps repel aphids. I use soap & water mixed in spray bottle,about half & half should do it, good luck. Try Safer-soap, a non toxic mild soapy spray. Can also be applied by wiping down the plant with a sponge, but when finished, throw the sponge away so you don't infect other plants. I read the answer re: milkweed for butterflies. I have a much harder time trying to grow them, from seed-starting, to trying to keep the sucking aphids off every day. Your other grower stated he had grown "tons" of milkweed in Spring Hill, FL. I spray regularly with soapy water, but that's not getting rid of enough in my butterfly garden. I have sandy soil, water, open sun exposure. What am I doing wrong? Thanks so much. Another method to get rid of aphids on plants is by going the biological way. You can introduce beneficial predators of aphids such as wasps, ladybird beetles and syrphid fly larvae. These natural predators are effective in controlling the aphids effectively. While using chemical pesticides, confine the application only to the infected parts, so as to conserve the population of these aphid enemies. Act quickly at the first sight of aphids and you will control them before causing serious damage to the plants. I live in Spring Hill, Fl and have tons of tropical milkweed. I plant the seeds sporadically throughout the entire year and therefore I always have some in bloom with the exception of Jan & Feb. I start planting the new seeds from the year before pods in February. Yes, they do get aphids but the monarch butterflies still lay their eggs on the plants which gives me plenty of caterpillars and then soon after chrysalis and then the beautiful monarch butterflies. As soon as a few plants get 6 inches high I plant more seeds in front of it so I have continuous plants. Most of the plants are in partial sun as they seem to do better than in the hot Florida sun that we have. Sometimes I use a very heavy spray of water (put your spray nozzle on the "jet" setting) on the aphids and they fall right off but I ignore them because the butterflies are still going to come. Yes, they look nasty but I have learned that it is worth the ugly look in order to have the beautiful butterflies. I do not want to spray any chemicals in my flower gardens as I want the bees and the butterflies to visit me and not get sick. Phyllis: I forgot to mention that the only reason I grow tropical milkweed is that they are a host plant for the monarch butterflies. The caterpillars are going to totally strip off every leaf from the plant so I don't care about the aphids. After all of the leaves are gone and the caterpillars have climbed my wooden fence and are tucked snug in their chrysalis I cut the plant down to about 8 inches off the ground and they start to grow all over again. You can do the same thing since you are only about 2 hours from me. The monarch butterflies like my zinnias, verbena and vincas also but those are not host plants. Is using soapy water on Hibiscus aphids as effective as purchasing a commercial product? Hibiscus are my favorites so I have had lots of experience with aphids/Hibiscus. I don't know if soapy water is safe to use, but I know that insecticidal soaps are safe for Hibiscus, but after you use the soap, it will take a while for the plant to recover from the "treatment". I use a water hose (or sprayer in the kitchen sink for house plants), and no soap. I turn the water on low force and wash the aphids off the bottom of each leaf. 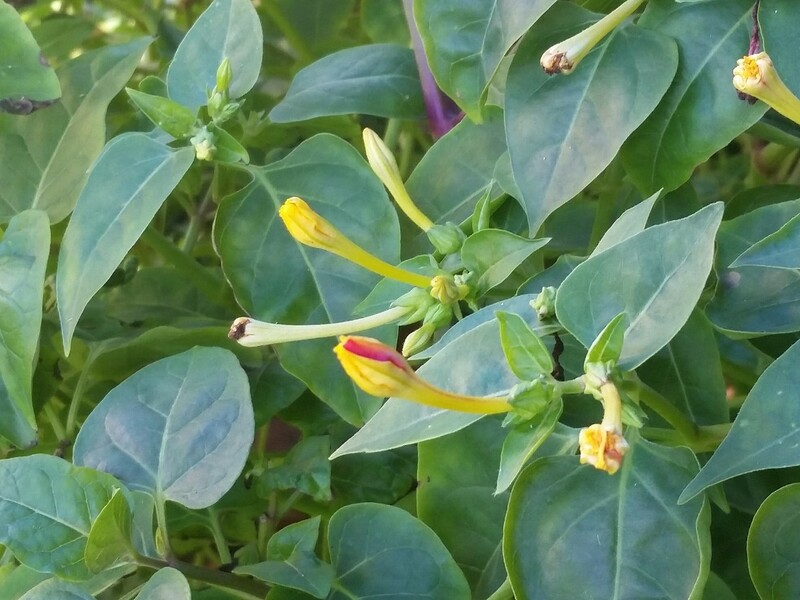 Once washed to the soil, they will not climb back up and the plant will not need time to recover from soap or chemicals, so the blooms will keep on coming. Should I give the hibiscus some fertilizer? Yes, fertilize and you should get more and bigger blooms. Be sure you don't over-fertilize or you will get lots of lush green leaves and no blooms. Is it OK to use Dawn dishwashing liquid soap in my mixture to kill aphids? I need a home recipe to get rid of aphids on my cabbage. Washing the cabbage off with cold water from a garden hose will do the trick. Once on the ground, the aphids won't climb back up. You need cabbage dust. Check garden supply shop, farm supply. There was a post awhile back about making your own pest control out of soap and water. I need a pest control for aphids and whitefly. Can someone help me? Any time you use soap or any other chemical on a plant, including Safer Soap, it sets your plant back and it takes a while for it to recouperate. To get rid of aphids, I use a water hose and spray them off the bottom of the leaves of the plants, they won't climb back up. When I get either one of them, I use a nozzle on the hose that I can spray really hard.. The water smacks their soft bodies hard & kills them. Now spidermites is a whole different thing. Aphids are trying to take over my houseplants. Help! If you use any type of spray, even something like Safer Soap, on your plants, it will take them a couple of weeks to recover, so I use plain old water to get rid of aphids. Place a plant in the kitchen sink, use the sprayer to spray the under-side of each leaf, washing off the aphids. If any fall into the soil, it's OK, the aphids won't climb back up. I have crepe myrtles and it's looks like the aphids are getting the best of them. Some are affected and some are not. The ones that are, are all in the same area. What should I use to get rid of them? Also, everything is blooming, and some of the other crape myrtles are blooming, but not the the three in question. I also have grasshoppers that are in my yard. I bought some "Seven". I haven't used it yet, will it work on the aphids as well? I know to be careful, because we don't want to kill the good insects. Thank you. Sometimes you can use the hose with a pretty forceful sprayer nozzle, and actually wash them awy. Or another thing to try that has worked for me for aphids on my tomatoes is to fill a sprayer bottle with water, add a couple spoons of dish detergent, and spray the plants. Be sure to spray both tops and bottoms of the leaves. It usually takes about 3 or 4 applications to get rid of them. Is it necessary to rinse soap from the tree after a certain time? Sticky tape can be an effective method for capturing many types of insects, including aphids. 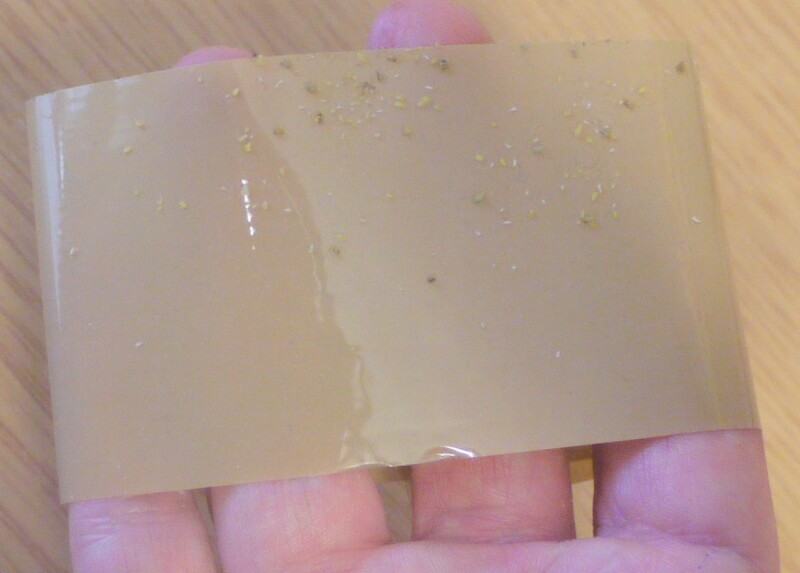 This is a guide about using sticky tape for aphids. 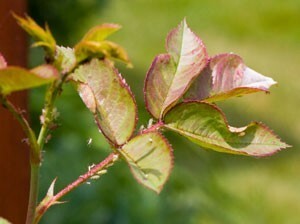 This is a guide about getting rid of aphids on roses. 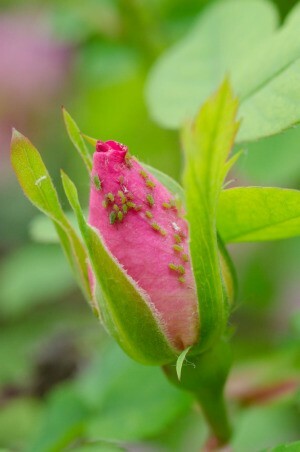 Aphids seem to like roses as much or more than we do.